At first it may seem that how to build a pergola is a rather simple task. There aren’t a lot of complicated structural components or hidden features with a pergola. It’s all right out there in plain sight. To be honest, it really isn’t that difficult of a project once you decide on what type of pergola you are building, and how it will interact with the rest of your home and garden. That is the kicker though, as a seemingly simple DIY project becomes intertwined with all the other landscaping and construction decisions you have made, or will make in the future. Those are concepts for other articles though. Here we want to focus more on the technical details of how to build a pergola. What tools will be necessary, what to watch out for, and some special case situations where things can get more involved. Generally speaking, the tools you use for a job aren’t as important as how well you can use them. There are many different ways of cutting joints, what is important is that you can cut them cleanly and square. For most of us, this would mean using a chop saw, though more skilled handymen may be able to get by with a skill saw or even hand saw. Chop Saw – sufficient for simple “square” builds. Compound Miter Saw – for irregular pergola designs. Jigsaw – for detailing the ends of runners. Power Drill – for boring bolt holes, predrilling for screws, and driving screws. Socket Wrench – for tightening or driving bolts. Power Sander – for cleaning up joints after cuts. Level – for making sure you get things level. Square – for getting things squared up. Important to use on cuts you’ve made, don’t try to force square with unsquare cuts. 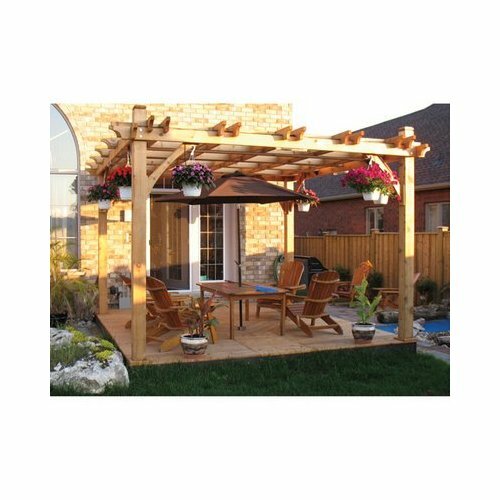 Often a pergola makes a great addition to a patio or other cement pad out in the yard. There are a couple ways you can go about adding the pergola in these cases. Which is right for your situation could depend on a lot of factors such as how much room there is around the cement pad, and what you use the cement pad or patio for. The first and simplest way is to pour new footers outside the concrete that is already present. This way you can incorporate the fasteners into the concrete pour easily. These footers need to be deep and heavy enough to ensure the posts will be solid, as if they aren’t it can cause your pergola to be rickety and place a lot more stress on the joints. The problem with pouring new footers is it takes up more room. Sometimes there just isn’t room available due to planters, the garage, or even the house. Also, it will lead to a pergola that is larger than the cement pad. This leaves more of the poured cement still usable, but could mean the pergola would have to be much larger than you’d like. An existing concrete patio can make a great base for a pergola. In most cases, pergolas aren’t extremely heavy structures, and so most patios are strong enough to support the extra weight. However, you can’t simply set the pergola on the patio like a table, it would be far too dangerous. So the trick is to tie the pergola down into the existing patio. There are a few ways you can do this, but the simplest is generally to drill holes into the cement and then epoxy bolts into the holes so that you can bolt down the fasteners. Building pergolas on existing decks can be a much easier project. Most decks have wooden structures, and tying a wooden pergola in works pretty well. The key is going to be to ensure that the deck structure provides enough stability to the pergola. Often this can be accomplished by replacing some of the deck rail posts with longer pieces of wood that will serve as posts for the hand rails as well as for the pergolas. These posts should ideally extend all the way down and have their own cement footers for maximum stability. As with building on existing concrete, once you get the footers sorted out, the rest of the build is not much different. However on decks there generally is the extra complexity of fitting the pergola posts into the deck railing. This added complexity works out for the best in the end though, as the hand rails will help to stabilize the pergola posts. Building a pergola that will be attached to a house or other structure can get a little more complex. Generally you will need to remove the exterior of the building where the pergola will attach. This is so you can get at the actual structure of the home to tie things together. In some cases you will find that the framing of the house or garage or whatever structure you are tying into is just not adequate to support the pergola. This is especially true in cases where there are no posts on the pergola itself on the house side of the structure. In cases where the pergola has no posts at all, and relies completely on the house for support, this can be a very intense project indeed. In most cases though, you can simply reinforce the framing of the house. This can still get messy because you have to remove a lot more siding than just where you will attach the posts. It may be a better option just to incorporate posts into the pergola side of the house. The pergola itself is a pretty open structure, but it doesn’t have to be that way. Especially in cases where the pergola will be used to train vines, the sides can be somewhat enclosed by the plant canopy to provide extra cooling and privacy. Building an arbor onto a pergola is a relatively simple project. A big reason why it’s so simple is that you can’t really screw it up. The arbor elements will actually help to stiffen up the pergola structure and make it stronger. THe only thing you need to watch out for is that the additional weight isn’t going to cause problems with the footers you’ve placed the pergola on.